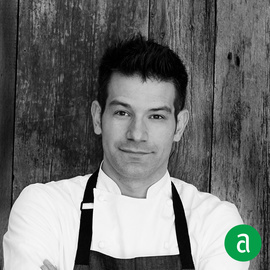 George Mendes, Chef and Partner of Aldea and Lupulo in New York City, shares his career timeline and words of advice for up-and-coming professionals. David Bouley told me to be patient and things will come to you, in due time. This career requires a lot of sacrificing, and if you remain patient, you'll find a lot will fall into place over time. Commitment is my number one thing that I look for when hiring. If you stay with a company for 2 years this shows that you are focused and learned the most possible from that restaurant. It also helps you build a resume that also shows your growth. And lastly, I look for work ethic, timeliness, confidence and professional attire. I find inspiration from many different directions, but within the last year, I have found running gives me time to release, get clarity, and have time to think. Sometimes I think of nothing during my run, and sometimes my mind is going 100 miles a minute, but after a run I always feel refreshed. It allows me to relax and regain my strength. Inspiration also comes to me after clarity of mind, a little bit of yoga, or even a walk in a new neighborhood. I also find it in museums: when I stare at artwork, it triggers something, maybe a new train of thought or new approaches to a dish that I've been testing out. Inspiration will also always still come from eating at colleagues restaurants, reading, and traveling. My stage at Martín Berasategui's restaurant in San Sebastien, planted the seed and created my vision for Aldea. The restaurant's concept was deeply rooted from the classics that he grew up eating from his family cooking. There was also a bistro in town that served traditional basque cuisine inspired by old world flavors, that I frequented very often. The whole experience during that time opened up a path and helped me figure out what I wanted Aldea to be. It’s my responsibility, not matter how busy as I am with both restaurants, to share my desire, motivation and passion with my cooks and sous chefs. I like to get them excited about the arrival of every season by sharing my vision and creating new dishes with them. I also spend time in both kitchens and love to be in the trenches cooking side by side with my teams. At heart, I’m just a cook and that's what I truly love about the industry. I knew that this was the right industry for me after my first stage in Paris, but my years at Bouley helped me begin to cultivate the relationships, and friendships I needed to continue my career growth. It definitely took some time to adjust being from small town Connecticut but I was energized! It was the best restaurant in US at the time, and I was working long hours, but I felt like I hit this stride; pushing myself harder every day. It ignited my love for the industry and the cuisine, and that was it for me! The culture, the connection to food, and cooking at such a high level was all I needed to stay motivated and inspired! My time at Tocqueville were formative years. I started putting a lot of things into practice and finding my voice. It was a good time to be cooking in NYC and very inspiring, especially being in such close proximity to the farmer’s market and being able to build the relationship with farmers. Good shoes are a necessity; it's impossible to get through a full service without a great pair on my feet!